09 Sep Feel Good Yoga Circuits! Here’s something new to add to your yoga practice! These 5 super feel good, moving yoga poses combine to create a powerfully energising and feel fantastic practice. These are some of my favourite movements to bring more radiance and vitality in to your body and then your whole day! I suggest trying three ‘circuits’, so once you’ve completed all 5 start again and do all of them twice more. This is a really fun way to bring loads of energy in to your practice make you smile and build some heat too. You could do this practice in the morning or any time of day when you want to energise (so maybe not last thing at night!) It’s perfect when you’re feeling a bit stuck, or low energy, or tired or in a bad mood and to ensure it’s really powerful focus on moving with your breath and breathing as deeply as possible. Your breath really is the key to this practice. P.S. These pictures were taken at the gorgeous Yoga Garden, a new studio in Newquay, where I’m so excited to be teaching two classes from next week. If you’re in Newquay click here for all the details. Lie down on your back. Stretch your legs up towards the sky. Bend your knees and take hold of the outside edges of your feet. Position your ankles directly over your knees with your knees just wider than your torso and flex your feet. Gently use your hands to pull your feet closer towards the floor bringing your knees towards your armpits. Rock your whole body over to the right side keeping hold of your feet until the toes of your right foot tap the floor then rock back up and over to the left until the toes of your left foot tap down. Repeat 10 times (5 on each side). Stand with your feet together. Bend your knees and lower your hips towards the floor like you’re sitting down on to an imaginary chair. Reach your arms up towards the sky, shoulder width apart and shoulders relaxed. Look up past your hands. Keep your core engaged, drawing your lower belly in. Take a deep breath in. As you breathe out straighten your legs (keep the knees bent if you have tight hamstrings or a hamstring injury) and bow forward. As your forehead moves towards your chins swing your arms back behind you. Do 10 rounds like this – inhaling to fierce pose exhaling to fold forward. Take a big step towards the back of your mat with your left foot. Keep your left toes turned in about 45 degrees. Bend your right knee over your right ankle and stretch your arms out wide at shoulder height. Gaze over your right hand in Warrior Two pose. As you breathe in straighten your front leg and reach your arms up over head until your palms touch. Look up in your dancing warrior pose. As you breathe out switch to warrior 2 facing the back of your mat (left knee bent, gazing over your left fingers) then inhale to return to dancing warrior and repeat 10 times (5 on each side). From your Warrior 2 straighten both legs and turn the toes out 45 degrees. Stretch your arms out wide overhead and gaze up. Take a deep breath in your star pose. As you breathe out bend your knees to sit in to a low goddess squat. Bend your elbows, keeping your elbows in line with your shoulders and fingers spread wide. Inhale to return to star, exhale to goddess, and repeat 10 times. Go to the wall for these if you like. From downward facing dog step your feet closer to your hands so your shoulders are over your wrists. Look straight down between your hands and spread your fingers wide. Lift your left leg towards the ceiling. Bend your right knee then hop up so the left lifts towards the ceiling. You can bend your right knee kicking your right heel in towards your left inner thigh for added momentum. Repeat 5 times then swap to lift the right leg. If you are confident in your handstand hops try kicking up with the left leg, scissor kicking and swapping the legs over mid air so you land on the right leg. Then kick up with the right and land on the left. Do this 10 times instead of the above. Once you’ve completed all 5 of the above moving poses you can start again with happy baby and try doing two more rounds of them all! 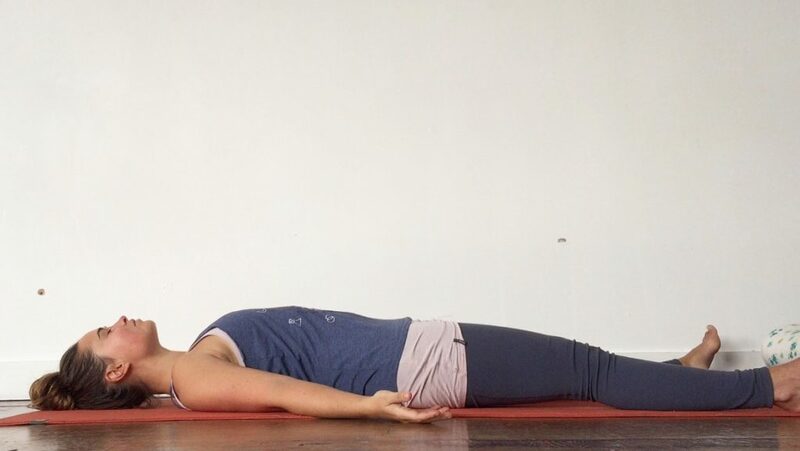 Then finish lying on your back in savasana for 5 minutes of total relaxation.